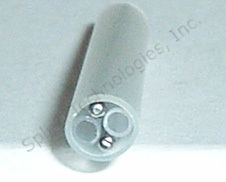 Splice Technologies' "Dual Fiber" series fusion splice protection sleeve provides individual conduits for two fibers in one sleeve. Our model numbers DFSS-SC40 & DFSS-SC60 Standard series fusion splice protection sleeves are 40 & 60 millimeters long respectively, and designed to accommodate two 900um diameter fibers, with an after-shrink diameter of 3.6mm, (.141 inches). Our model number DFSS-MC40 Mini fusion splice protection sleeve is 40 millimeters long and can also accommodate two 900um diameter fibers, with an after shrink diameter of only 2.9mm, (.114 inches). Our DFSS-RC40 Micro sleeve is also 40 millimeters in length but can accommodate up to 400um diameter fibers with a smaller after shrink diameter of only 2.2mm, (.085 inches). These products are constructed with two inner EVA meltable adhesive tubes, two stainless steel strength members, and one polyolefin heat shrink outer tube. 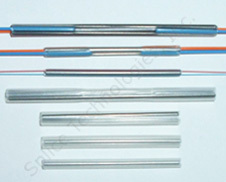 The tubes are clear to allow viewing of the fiber during and after splicing. This product has been proportionately downsized using the same core materials, formulations and manufacturing processes that are used in our "Standard" series product. The entire assembly is designed to ensure that all members maintain perfect alignment during shipping, handling and shrinking. We are proud to say that all of our products are made here in the USA and most sleeves are in stock ready for immediate delivery.